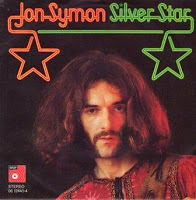 Jon Symon –Silver Star Part 1/ Silver Star Part 2 –BASF 0612441-4 (1975 Ger)British squaddie makes good! 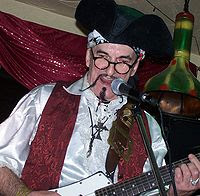 Following deployment with Her Majesty’s armed forces in Germany, Jon Symon AKA Rasputin set himself up as a one man band playing across Germany and Austria. Following the Sweet Eliza and Mighty Quinn singles as Jon Symon’s One Man Band (BASF) he released this grungy yet gleaming Proto Punk/Glam scorcher. Probably featuring a full band (or does he play all the instruments himself?) the guitars roar and squeal à la Thunders during the break and ably counter-balance any of the gloss conveyed by the backing vocals. I composed the number and played the Guitars (Rhythm and if I remember rightly) the rather simple solo! on the A Side. The Instrumental solo on the "B" side was Frank Dietz - a then very well known German musician. The Bass was played by none other than Georgia Moroder, who owned the studio where it was recorded (Arabella in Munich). The drummer was my manager Cliff Koch. 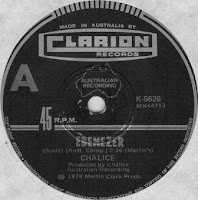 Chalice were based in Perth but were formed by a bunch of Mancunian exiles who released three singles on the Clarion label before moving on to Polydor where they released the Overflow LP and another 3 singles. They plied their trade primarily as a cover band, but based on Ebenezer, they could pen a mighty tune and perform it with gusto. Ebenezer is a prime example of Powerpop Boogie featuring slide guitar over a poppy yet rocking centre. If anyone has spares of their other two Clarion singles, please let me know as a trading opportunity would be most welcome. The B side is a non consequential cover of the Neil Young tune. 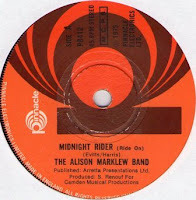 Reminiscent of Punchin’ Judy or Slack Alice; Midnight Rider rides along in rampant fashion. It has wonderful lyrics full of obvious double entendres, which position it perfectly into a non PC mid 70s mould. I couldn’t find any information on the band, but could there be a connection to The Kim Marklew Band? -They seem to be of the right age group...Anyhow, whoever they were - the beat thuds, the hands clap, the guitars roar... so all in all it’s a perfect Junkshop Glamster. Strap yourself onto this baby and enjoy the ride! That’s fine is a great raucous post 1st album single-only track from these Boy Room Smokers. Arranged by ex System leader Bob Seger; the track conveys a snarly Michigan Garage Punk feel -just check out those lo-fi cavernous drums that propel the cool double lead vocal performance (is that Bob Seger “duetting ” here)? The track and performance really reminds me of Steppenwolf’s Who Needs Ya from the previous year due to the vocal tradeoffs and similar chug/ melodic verse structure. 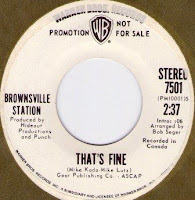 It’s easy to forget just how great Brownsville Station could be and this single provides ample evidence that it is worth venturing beyond their classic Yeah! LP from 1973. Originally released as the B side of the Northern collectable Name It You Got It (Decca F 13555), this issue is more of interest here as it also offers up a fun instrumental version as the B side. 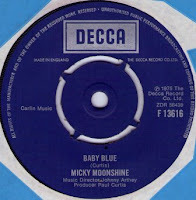 Micky Moonshine was in fact Scottish Beach Boy aficionado/artist Chris Rainbow and Baby Blue fits nicely within the Rock ‘N’Roll Revival/Glam crossover stylee (think Carl Simmons/ Mike Douglas with a sprinkling of Alvin Stardust). It’s has nice loud guitars and slide, a thumping beat along with a determined sounding lead vocal. 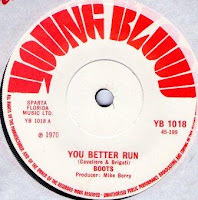 Note these Boots were NOT the Boots who released a couple of singles on CBS in ’68. It’s a cracking version of The Young Rascals classic, with some blistering lead guitar; over-saturated much in the same way as on Machine by Ning. It’s an all round rousing performance with a great lead vocal. The band composition A to D (not the Small Faces track...or was that E to D?) is a brooding underground number again with some strong but less fuzzy guitar. The talking clock is a fun touch. The tracks were probably recorded at RG Jones or Radio Luxembourg. David Bown from The Boots (Gregorian Chant), sent in his memories and these cool shots...Thanks Dave! 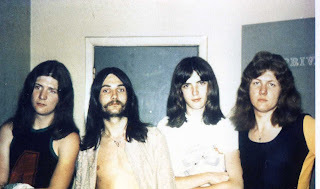 Don Wright - lead Guiar, Paul White - Drummer, Terry Bown – Bass Guitar & David Bown lead vocals. 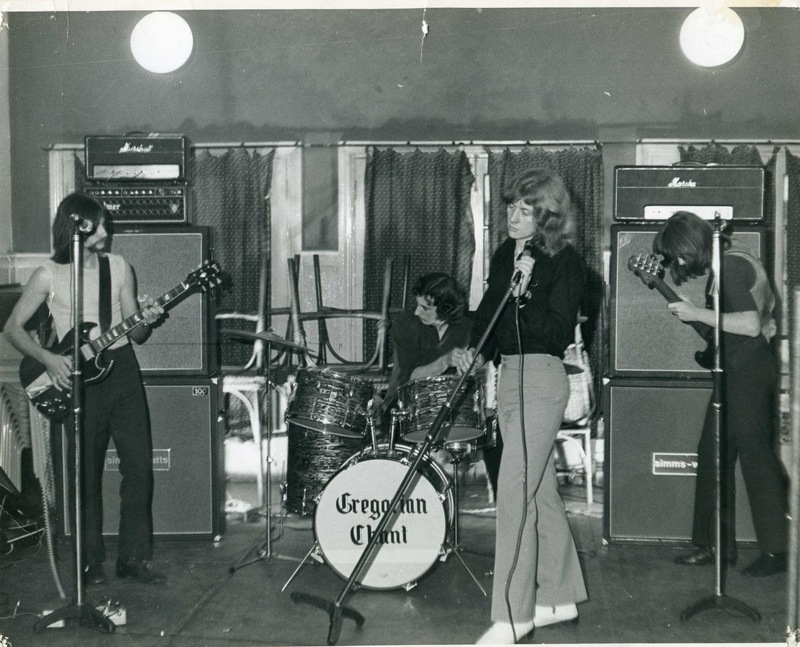 We were a young bunch of very enthusiastic semi pro musicians writing our own songs, playing pubs and clubs striving to make a career in music. We met Mike Berry and he arranged for us to record the Young Rascals “you better run” in the Luxembourg studio behind the Hilton Hotel. After the release of our record, ( which incidentally was the YOUNG BLOOD labels follow up to Indian Reservation by Don Fardon , Don was also from Coventry) we wanted to make music a full time career. Unfortunately at the time Paul our drummer decided he didn’t want to go pro but stay as an accountant, at which he has been very successful to this day. 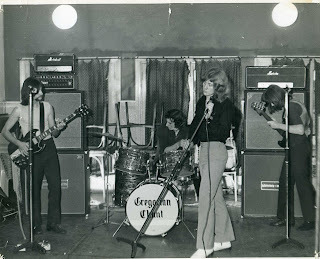 So brother Terry, Don Wright & I had to find a new drummer, we firstly found a power house of a drummer from Birmingham Les Fortnam, a really well accomplished drummer (ex Bob Cats of Blue Peter 1966 fame) Les played very much in a John Bonham style and could really lay down a solid beat. Les was a great drummer, he stayed with us a few months however due to a number of things, Mike B being one of them he sadly left the band. Les was replaced by a very young more technical Steve Palmer (young brother of Carl Palmer of ELP fame) at the same time we drifted away from Mike B and started writing and performing more of our own material and less covers. With help from John Tully “Inter City Artists” we started getting some good gigs, we changed the band’s name to Children, a bit soft this, so soon after the band’s name was changed again to Canyon. We played some great gigs around the country, supported a lot of top rock bands and were offered a few deals however nothing was ever taken up and after 18mths we split and all went our separate ways. Don, Paul and I did get together again 5 years after the original band split, be it semi pro working discos and clubs in a covers band - “Dave and the Sun” Ha! what a name, this band evolved into “JOKER” and with all new members I had another short spell full time, a covers band I enjoyed being in immensely. By the late 70’s other than Terry the three of us were playing very little and by the early eighties we had lost touch completely. When I look back it was a shame the original band didn’t stay together and an even bigger shame that Canyon split, Don, Steve and Terry were and are three of the finest musicians I have ever seen, let alone worked with, we wrote some great songs together and its a real shame that we have no record of what we did.. Another guy I really enjoyed working with was the bass player in JOKER Rob McKenzie, he was also a great singer, when Joker split he wanted us to form a vocal duo, I wasn’t up for it at the time, I regret very much not having done that. I suppose there are 1000’s of stories very similar to this one, I hope like me that the guys in those bands had as good a time as I did.